Fret-King Super-Matic, SG-Shaped Guitar from JHS. 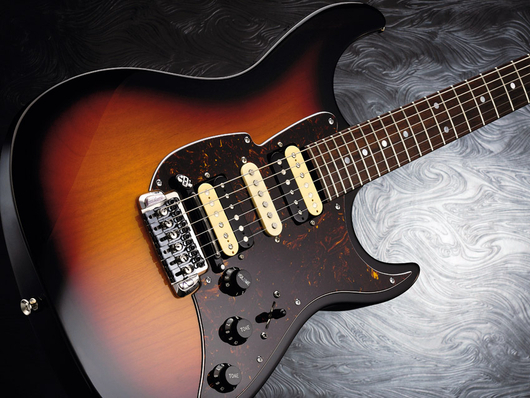 The Fret-King Super-Matic self-tuning guitar receives its European launch at Musikmesse. It features a Wilkinson ATD HT440 self-tuning hard tail guitar bridge, and six preset tunings allowing the player to move from standard tuning to open E, open G, DADGAD and more. Another European debut is the Fret-King Black Label JD guitar, co-designed with guitarist Jerry Donahue. 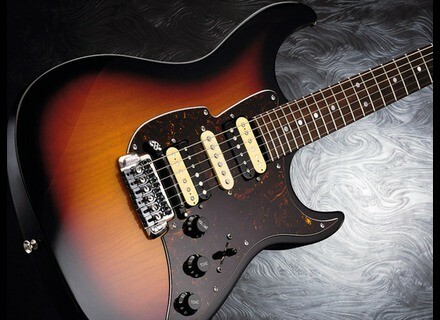 Set to be released in summer 2011, the guitar has been built to Jerry's standards. Also seeing its launch at Musikmesse is the Odyssey Premiere range of brass and woodwind instruments. Available in the Odyssey Premiere range are clarinet, flute, saxophone, trumpet, pocket trumpet, flugel horn, cornet, baby French horn and trombone outfits. Make sure you stop by at the JHS Messe stand at Hall 4.1 F17 to check out the full range. [Musikmesse] Jaden Rose Guitars Spider Hz Jaden Rose Guitars unveils the baritone Spider Hz, an 8-string extended range that features an Original Series style carved top mahogany body and bubinga neck. [Musikmesse] 5 New T-Rex Engineering Fuzz Danish effects pedal maker T-Rex have five new, retro-looking stompboxes to show-off at this year's Musikmesse. [Musikmesse] Diezel Hagen Diezel debuts a new guitar amp, Hagen, in Frankfurt this week.